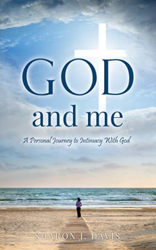 Sharon J. Davis’s new book, God And Me - A Personal Journey to Intimacy With God, ($12.99, paperback, 9781498476959), is a captivating memoir of triumph and renewal – the inspirational story of the author’s action when up against seemingly insurmountable challenges. Faced with a scary, unexpected medical condition, bills piling up, and a son to care for on her own, Sharon felt totally alone. A believer from childhood, she had always known God, but recently had lost focus on Him. She prayed without listening for His answer. She worshipped without looking for signs of His hands in her life. Angry with God, she stopped praying. She was convinced that she was being punished for her every bad decision, every thoughtless action. As her condition worsened, Sharon felt her body was failing because she failed God. Faced with this reflection of mortality, Sharon turned to prayer. God took over from there, showing her that He had been listening and present with her all along. This honest, heartfelt testament will inspire those who have watched their faith slip from their fingers to reach out and grab it once again. Sharon J. Davis has studied God's Word in several classes. She has been a faithful member of one Bible-Believing church for the last 24 years where she learned much about Jesus Christ and how to apply His Word. And during her times of adversity, she received a Masters of Education in Human Resource Development, with emphasis on adult learning. As a consultant and mentor, she has helped many adults – young and old – and she has witnessed troubled people that need God in their lives. Xulon Press, a division of Salem Media Group, is the world’s largest Christian self-publisher, with more than 15,000 titles published to date. Retailers may order God And Me - A Personal Journey to Intimacy With God through Ingram Book Company and/or Spring Arbor Book Distributors. The book is available online through xulonpress.com/bookstore, amazon.com, and barnesandnoble.com.